Window washers Sean Kikuchi and John Hufana scaled down the face of the First Hawaiian Center at Bishop and King streets yesterday in downtown Honolulu. 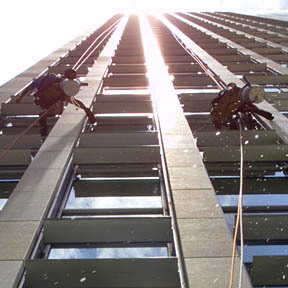 According to Kikuchi, the building is the tallest on Oahu, and it takes approximately a week to wash all of its windows. »What do you get when you breed Labradors with poodles? »Can a book bind together a community?